A joint investigation between Bellingcat, The Insider, and McClatchy DC Bureau has conclusively identified another key person of interest in the ongoing investigation of the downing of Malaysian Airlines Flight 17 (MH17). The person known as ’Andrey Ivanovich’, a.k.a. call sign ‘Orion’, is in fact a high-ranking Russian GRU officer named Oleg Vladimirovich Ivannikov. Research and report by Moritz Rakuszitzky, Daniel Romein, and Roman Dobrokhotov. Additional research and editing by Aric Toler and Klement Anders. A joint international open source investigation led by Bellingcat has identified conclusively that the person of interest known as ‘Andrey Ivanovich’ or ‘Orion’ whose identity is sought by the Joint Investigating Team in connection with the criminal investigation into the downing of MH17, is in fact Russian citizen Oleg Vladimirovich Ivannikov, born on 2 April 1967. Bellingcat has determined with very high certainty that at the time of the downing of MH17, Oleg Ivannikov was an officer of the Main Directorate of the General Staff of the Russian Ministry of Defence (GRU), and served in that function until at least as late as September 2017. Bellingcat has also established with very high certainty that Oleg Ivannikov, using the alias ‘Andrey Ivanovich Laptev’ in a covert operation for the Russian intelligence services, served as chairman of the Security Council (2004-2006), and as Minister of Defense and Emergencies (2006-2008) of the self-proclaimed Republic of South Ossetia. The Bellingcat-led investigating team used primarily open source data sources to reconstruct a curriculum vitae of Oleg Ivannikov. As detailed in the biographical timeline below, Ivannikov was born in Eastern Germany as son of a decorated Russian major general, before attending a Soviet military academy in Kyiv, and graduating from the Aerospace Faculty of the Moscow Aviation Institute in Moscow in 1990. At an undetermined stage between his graduation and 2003, Ivannikov became a military officer working for GRU. During his undercover deployment in South Ossetia from 2004 to 2008, Ivannikov provided military guidance to the breakaway region at a time when both Russia and Georgia competed for its closer reintegration. During his term in office, military tensions between South Ossetia and Georgia escalated, with Russian mercenaries joining South Ossetian militias in attacking Georgian peacekeeping forces, and at one point shooting down a Georgian reconnaissance drone. After stepping down from ministerial position in 2008, Ivannikov pursued a PhD degree in Russia with a thesis titled “The Complex Nature of the Information War in the Caucasus”. From 2012, Ivannikov served – under his real name and credentials as ‘military expert’ – as director of the Russia-Caucasus Research Center of the state-funded International Institute of the Newly Established States. In this capacity he published more than twenty articles, mainly about the war in Syria and the conflict between Georgia and South Ossetia. Simultaneously, he continued to play a limited role in South Ossetian political life via his alter ego, establishing a research institute in South Ossetia, and at one point publicly endorsing a presidential candidate. Ivannikov continued publishing articles as director of the Russia-Caucuses Center until late 2013. The reporting team has also determined with high certainty that Oleg Ivannikov was the person behind the covert name ‘Andrey Ivanovich’ who, according to multiple reports by Russian militant commanders and separatists fighting in the so-called ‘Luhansk People’s Republic’ (‘LNR’), was military adviser and de facto handler of the political leadership of the LNR in 2014. Ivannikov was deployed to Ukraine at an undetermined point in the first half of 2014, and remained there at least until early 2015. During his undercover deployment to LNR, he coordinated and supervised the military activities of Russian militants, pro-Russian separatists and “private army” contingents from the Wagner group. Ivannikov also supervised the procurement and transport of weapons across the Russia Ukraine border. He held these functions at the time of the downing of MH17. The findings in this report for the first time establish the direct or indirect involvement of a high-ranking Russian military officer on active duty operating on the territory of Ukraine in the destruction of the airliner. One day after the downing of MH17 over eastern Ukraine, on 18 July 2014, the Security Service of Ukraine (SBU) published intercepted telephone conversations allegedly related to the criminal act that led to the deaths of all 298 people on board the plane. One conversation dated 14 July 2014 – three days before the downing – was reported to be between Oleg Bugrov, former Deputy Minister of Defense of the LNR, and a man referred to as ‘Andrey Ivanovich’ with the call sign ‘Oreon’, who, according to SBU’s description to the call, was a Russian citizen and officer of the GRU. In this conversation, ‘Oreon’ is heard boasting that “they” have come into possession of a ‘Buk’ and will start shooting down [Ukrainian military] planes with it. According to a 18 July 2014 statement by the SBU, the Buk-M1 missile launcher that downed MH17 was transported from Russia to Ukraine during the night of 16 to 17 July 2014. It is unclear from the call whether ‘Oreon’ was referring to a different Buk that had been procured in Eastern Ukraine on or before 14 July 2014, or about the Buk that was expected to arrive later that week. Screenshots of the 18 July 2014 SBU video of intercepted telephone calls related to the downing of MH17. The same persona – ‘Andrey Ivanovich’ with the call sign ‘Orion’ (Oreon) – was referenced again on 28 September 2016, when the Dutch-led Joint Investigation Team (JIT), responsible for the criminal investigation into the downing of MH17, published more intercepted telephone conversations in a call for witnesses. The JIT appeal focused on identifying two individuals: the aforementioned Andrey Ivanovich with the call sign ‘Orion’, and Nikolay Fedorovich with the call sign ‘Delfin’. In a previous joint investigation, Bellingcat and The Insider identified the person behind the covert alias ‘Delfin’. Out of the five conversations published by the JIT, two conversations were between Andrey Ivanovich ‘Orion’ and Nikolay Fedorovich ‘Delfin’. ‘Orion’ appeared also in a third intercept, speaking to a third individual. ‘Delfin’, in turn, appeared in two other conversations speaking to a fourth individual. In our report on ‘Delfin’, we pointed out that ‘Orion’ addresses ‘Delfin’ with the formal form of you in Russian (‘вы’), while ‘Delfin’ addresses ‘Orion’ with the informal form (‘ты’), an indication that ‘Orion’ has a lower military rank and/or is younger than ‘Delfin’. As described in our previous report on ‘Delfin’, the exact role of Andrey Ivanovich ‘Orion’ and Nikolay Fedorovich ‘Delfin’ in the MH17 tragedy cannot be determined from the released telephone calls included in the JIT’s call for witnesses. While ‘Orion’ and ‘Delfin’ appear to discuss, in different segments of the JIT-released calls, procurement of a crane and trailers, as well as repatriation of certain military equipment across the border, no one explicitly mentions a ‘Buk’. Furthermore the JIT did not disclose the date and time of the intercepted calls. However, considering that the JIT specifically requested more information on the two individuals involved in these five conversations, and in the SBU-released calls ‘Orion’ discussed a Buk while discussing plans to start “shooting down [Ukrainian military] planes” just days before the downing of MH17, it is highly likely that ‘Orion’ had a role, at a minimum, in the transport of the Buk missile launcher that downed MH17. The third conversation between ‘Orion’ and another person is the one most likely to be directly related to the downing of MH17, as the route and convoy described in the call matches that of the Buk missile launcher from the day of the tragedy. Novaya Gazeta reported on 13 July 2015 (archive), based on interviews with former separatist sources, that Orion was a military advisor to the LNR command and that he “is or was an officer from Russia’s Ministry of Defense.” This information is corroborated by additional reports from sources familiar with the situation in Luhansk from 2014-2015, including a blog post from a former separatist combatant describing how ‘Andrey Ivanych’ was sent to the LNR as an advisor from Russia and worked with former LNR leader Igor Plotnitsky in a military commissariat building. (In Russian, ‘Ivanych’ is a colloquial variant of the patronymic ‘Ivanovich’.) According to this post, while based in Luhansk ‘Andrey Ivanych’ was in close contact with the authorities in Moscow, even providing recommendations on political appointments in Eastern Ukraine to Vladimir Putin’s advisor Vladislav Surkov. The military advisor who went by the name ‘Andrey Ivanych’, per the post, possesses two traits that matches the ‘Andrey Ivanovich’ from the intercepted calls: a distinctly high voice, and a background in military intelligence. In an interview with Russian pro-government news site Ridus on 15 May 2018, a former battalion commander of Russian and separatist militants in the LNR, Evstafiy Botvinyev, stated that a certain Andrey Ivanovich, based in LNR during the summer of 2014, was his de facto commander. Botvinyev also claimed that Andrey Ivanovich directly supervised the (then) defense minister of LNR Igor Plotnitzky, and Dmitry Utkin, the commander of the Russian private army known as Wagner. Botvinyev told the new site that Andrey Ivanovich was part of certain “public structures” in Russia that provided funding, instructions, and protection to the Wagner private army, which has been active both in the Russia-Ukraine military conflict and in Syria. Initially, Bellingcat attempted to identify the persona behind ‘Orion’ by the method used to identify ‘Delfin’ – i.e. by identifying all possible candidates with matching name and patronymic and securing voice samples, in the hope of obtaining a match, as described later in this report. For at least two reasons, this approach was quickly deemed ineffective. First, ‘Andrey Ivanovich’ is a relatively common name-patronymic combination among Russian names. Second, assuming ‘Orion’ might indeed by a GRU officer, as claimed in the SBU intercept release, the likelihood of him using his real name and patronymic in communication on open (GSM) lines was deemed negligible. This assumption was corroborated by a 2016 post from an LNR insider asserting that ‘Andrey Ivanovich’ was an alias and not the real name of the Russian military adviser to LNR. Instead, Bellingcat used a different starting point for its identification process. In the initial publication of the phone call intercept from 14 July 2014, the SBU had included the phone number used by ‘Orion’ in that call: +380634119133. The Ukrainian mobile number visible on SBU’s video was disconnected shortly after the publication of the intercept. Bellingcat investigated an extensive list of open source databases of telephone numbers in the hope of identifying this number. Ultimately, the number was found in two telephone number-sharing apps popular among Russian speakers, one of which was TrueCaller. Oreon’s telephone number showing up in TrueCaller. As seen in this screenshot from TrueCaller, the owner of the telephone number is described as ‘Oreon’, identical to the spelling of the call sign initially announced by SBU, and slightly different than the ‘Orion’ spelling used in the subsequent JIT releases. The difference might be explained by the nature of phone-sharing apps which aggregate all contact lists of their users. Therefore, the owner of a telephone number may appear with various spellings – or even different names – reflecting the way this number is described in the contact list of the user who first introduced it into the phone sharing app. The operator of the mobile number, ‘Life’, offered anonymous prepaid SIM cards in Eastern Ukraine in 2014. Thus Bellingcat assumed it is unlikely that the number would be registered to an actual identifiable person. In early 2018, while working with several investigative reporters on a joint unrelated project, Bellingcat, through a Ukraine-based reporter, obtained access to mobile traffic data for the Ukrainian mobile number listed under the name ‘Oreon’. Four Russian mobile numbers were found that had received or originated calls to the Ukrainian number belonging to ‘Oreon’. These Russian numbers became the focus of Bellingcat’s further investigation. Bellingcat checked all four Russian numbers against various open source telephone-number databases. Two of the numbers appeared in phone-sharing apps, and one of the them appeared in two phone-sharing apps. Bellingcat deemed this latter number to be of particular interest. In one phone sharing app, this number appeared under the name ‘Andrey Ivanovich GRU – from Husky’. In the other phone-sharing app, the same number appeared under the name ‘Ivannikov’. The Russian telephone number that ‘Oreon’ called appears in phone-sharing apps as ‘Andrey Ivanovich GRU from Husky’ and ‘Ivannikov’. This discovery provided Bellingcat with an initial confirmation that the persona behind ‘Orion’ is indeed known as ‘Andrey Ivanovich’ and plausibly linked to GRU. Crucially, it provided the investigating team with the clue that he may be known under the (family) name ‘Ivannikov’. The ‘from Husky’ comment next to the name in the first app suggested that the number had been obtained from a person or organization known as Husky. We identified a special operations military unit in the Donetsk People’s Republic using the call sign ‘Husky’. Following this discovery, the investigating team searched for additional open source data on the Russian telephone number in combination with the name ‘Ivannikov’. Bellingcat located this number in two databases: in a Russian open source online telephone database, and on a now defunct e-commerce site with an exposed customer and order-booking database. In the exposed database of the defunct Russian web shop, the same telephone number appeared in the customer profile of a person named ‘Oleg’, who had ordered an ‘elevation training mask’ from that website in 2017. The address for delivery noted in the database was not Ivannikov’s home address, but a different address in Moscow, described as ‘ulitsa Polina Osipenko 76’. Searches both in Google maps as well as Yandex Maps showed that this address did not exist, as house numbers in this street do not exceed the number 22. A reporter from ‘The Insider’ traveled to review the address, and drove the street until the end at number 22. He noticed, however, that the street morphs into Khoroshovskoye shosse’, a section of a highway running through Moscow. The reporter proceeded to number 76 on that road, and realized he was standing in front of the headquarters of the Main Intelligence Directorate, or the GRU. 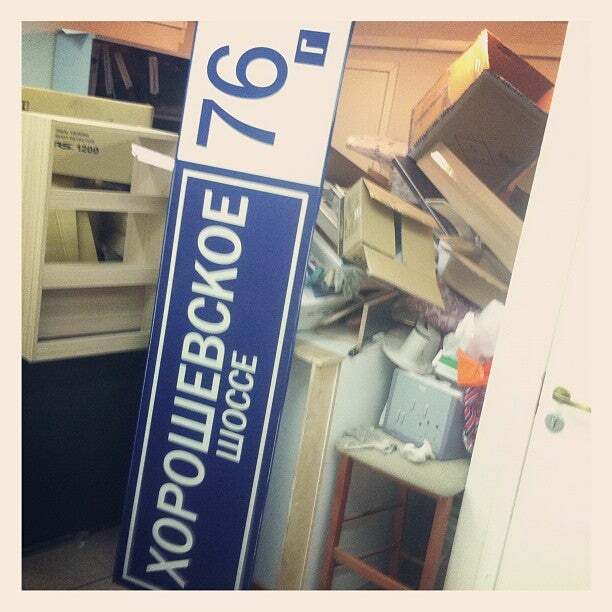 The official address of the GRU is ‘Khoroshovskoye shosse 76’, as identified in open sources. Screenshot of the order for an elevation training mask, made by Oleg Ivannikov on 20 March 2017. Yandex Maps showing the GRU headquarters (blue rectangle) on ‘Khoroshovskoye shosse 76’, the ‘Khoroshovskoye shosse’ marked as a blue line, ulitsa Polina Osipenko as a red line. All buildings to the south of ulitsa Polina Osipenko have ‘Khoroshovskoye shosse’ as address. After obtaining sufficient level of certainty that the person Oleg Vladimirovich Ivannikov is linked to GRU and is likely to be the same person known as Andrey Ivanovich ‘Orion’, the investigating team needed to determine which of the two names – if any – is the actual legal name, and which is the cover name. Bellingcat’s hypothesis was that Oleg Vladimirovich Ivannikov was the true identity, and Andrey Ivanovich was an alias for covert operations. This hypothesis was supported by the discovery of a 2003 record for a person with an identical full name and birth date, in an open source automobile registration database from Rostov-on-Don. In order to confirm this hypothesis beyond any doubt, Bellingcat and The Insider reviewed address registration details of an Oleg Vladimirovich Ivannikov, born on 2 April 1967, who resides at the same address identified by Bellingcat in open sources. Based on the registration records, the team could further establish that this person is – or was at one point – an officer with the Russian Ministry of Defense who had graduated from the Kyiv Military Aviation Engineering Academy in 1988. The investigating team also obtained a 2012 photograph of Ivannikov. A 2012 photograph of Oleg Vladimirovich Ivannikov, born on 2 April 1967. As last step in confirming that the Russian citizen Oleg Vladimirovich Ivannikov, born on 2 April 1967, is the actual legal identity behind the person of interest to JIT known as Andrey Ivanovich a.k.a. Orion, Bellingcat and the reporting team needed to obtain a voice sample from Ivannikov, to be compared with the samples published by JIT. Attempted phone calls to Ivannikov’s Russian mobile number were unsuccessful as the number appeared continuously offline. Seeking for additional forms of contact, Bellingcat identified a landline telephone number registered in the name of a relative of Ivannikov, residing (according to a Russian open source database) at the same address where Oleg Ivannikov is registered to. The Insider called the landline number twice, seeking to speak with Ivannikov. During the first call, a relative of Ivannikov answered the phone and said that he was not at home, suggesting a call later that day. During the second phone call, Ivannikov was at home, but refused to talk. When his relative asked him ‘Is it convenient now to take the call?’, Ivannikov shouted from a distance ‘No, it is not convenient now’. The sample of Ivannikov’s voice, while indicating a very strong similarity to the JIT sample, was too short to provide forensic-level certainty of the identity of the person. After months of monitoring Ivannikov’s mobile number in various messenger apps, Bellingcat noticed that the number was online in March, and attempted a phone call. The call was made under the pretext of seeking contact with a different ‘Oleg Vladimirovich Ivannikov’, a relatively well-known NGO head who makes frequent media appearances, as described later in this report. After the call was answered, our investigator inquired if the person he was talking to was Oleg Ivannikov. The person on the other end of the line implicitly confirmed and asked what the call was about. Bellingcat then inquired if the person on the other end was the Oleg Vladimirovich Ivannikov who was the head of the NGO. Ivannikov replied that he was not, and added that he wished he was that famous person, but that this was a different person. On the basis of all collected evidence, including mutually-consistent records from multiple open sources, residential records, and voice data obtained in the course of the investigation, Bellingcat and its reporting partners conclude with very high certainty that Oleg Vladimirovich Ivannikov, born on 2 April 1967, is the person of interest whose identity was sought by the JIT in the 28 September 2016 cal for witnesses. Oleg Ivannikov’s address registration records provided basic information about the man sought by the JIT. Cross-referencing this information in open sources provide a significant volume of additional information which permitted Bellingcat to reconstruct, with high level of certainty, key events from Ivannikov’s curriculum vitae. Oleg Vladimirovich Ivannikov was born on 2 April 1967 in and around Karl-Marx-Stadt (now Chemnitz) in what was East Germany. Several Soviet military units were located in Karl-Marx-Stadt, implying that one of his parents was likely serving in the Soviet military. Based on Olev Ivannikov’s residential registration records, his father’s name full name is Vladimir Pavlovich Ivannikov. A man named Vladimir Pavlovich Ivannikov was at some point the commander of the 53rd Guards Fighter Aviation Regiment, stationed in Šiauliai in the Lithuanian SSR throughout the Soviet occupation of Lithuania. Oleg Ivannikov, in an interview given in his capacity of military expert in the context of a 2014 article about the secret services in the Baltic States, is described as having lived in Lithuania for some time. Considering the identical full names, common professions, and biographical details of Oleg and Vladimir Ivannikov, it may be presumed that Oleg is the son of Major General of Aviation Vladimir Pavlovich Ivannikov. According to a 2003 passport application, contained in the registration records, Oleg Ivannikov attended the Kyiv Military Aviation Engineering Academy in Kyiv in the 1980s and graduated from this academy in 1988. Copy of a 2003 passport application showing various biographical details about Oleg Vladimirovich Ivannikov. This document includes his place of birth (Karl-Marx-Stadt), his father’s name (Vladimir Pavlovich Ivannikov), his education (Kyiv Military Aviation Engineering Academy in the 1980s), his marital status (married in 1988; the name of his wife is redacted), and former residence (Rostov-on-Don in 2003). Soon thereafter, Ivannikov moved to Moscow for a postgraduate specialization at Aerospace Faculty (dubbed as ‘rocket department’) of the Moscow Aviation Institute. His name appears on a 1990 list of graduates of the department’s graduate club. The official name of Ivannikov’s specialization is not known, as the department program names have changed, but the Aerospace Faculty of the Moscow Aviation Institute offers various master courses and specialization related to missile systems. Photographs in the 2009 photo gallery archive of the faculty show Buk 9M317 surface to air missiles, the successor of the Buk 9M38 type of missile that downed MH17. After his graduation, Ivannikov moved to Rostov-on-Don, where he lived through at least 2003. In 2004, Ivannikov moved to South Ossetia, initially serving as Chairman of the Security Council, and later as Minister of Defense and Emergencies from 2006 to 2008. During this period he acted under the pseudonym ‘Andrey Ivanovich Laptev’. Notably, in four years of public service in South Ossetia, two of which as government minister, there was not a single published photograph, video or audio recording of “Andrey Laptev”, despite a number of interviews or statements issued by him in text form. By contrast, Bellingcat identified photo and/or video records of all other government ministers of the period 2006-2008. This unprecedented secrecy for a government minister provided additional circumstantial evidence that the person in that position was serving a covert role under a pseudonym, as any public appearance by Ivannikov would have exposed him to identification from people in his social circles. Due to the relevance of this secrecy to the identification of Ivannikov’s links to GRU, his role as Minister of Defense of South Ossetia will be described in detail in a separate section later in this investigation. After returning from South Ossetia in 2008, Ivannikov wrote a PhD thesis (as a candidate of philosophy), titled ‘The Complex Nature of the Information War in the Caucasus: socio-philosophical aspects’, which he defended at the Southern Federal University in Rostov-on-Don. An extract is available from the university’s website; the full text of this thesis, which is not freely available, was obtained by Bellingcat. This thesis refers to earlier publications by Ivannikov from 2006 to 2008 about the so-called information war in the Caucasus and the wars in the region in general. The thesis, which cites, among others, works of Russian nationalist conspiracy theorist Alexander Dugin, proposes coordinated Russian counteraction of the so-called “western information and cultural infiltration of the Caucuses” by means of “special groups consisting of high-ranking officials, representatives of various special services (SVR, GRU, FSB, etc. ), scientists with high intellectual potential, engineers, sociologists, political scientists, culturologists, psychologists, patriotic workers of mass media and cultural figures”. Bellingcat confirmed that the thesis belongs to the person of interest Oleg Vladimirovich Ivannikov, based on graphological comparison of the signature on the thesis paper with the one on a form signed by him and contained in his residential records. Additional circumstantial evidence was the timing of the thesis and the underlying publications, which were written around the same time the persona “Andrey Laptev” worked as a GRU officer and as Minister of Defense of South Ossetia, tying his work experience directly to the topic of his academic pursuit. On 2 July 2012, Ivannikov – using his real name – became director of the Russia-Caucasus Research Center of the International Institute of the Newly Established States in Moscow. The International Institute for Newly Established States is a Moscow-based think tank whose publications are focused on maintaining Russian sphere of influence in the republics of the former Soviet bloc. The institute does not disclose its sources of funding. Notably, at the same time when Ivannikov was appointed as director of its Caucuses branch, Polish citizen Mateusz Piskorski was appointed director of its East Europe branch. In 2016, Piskorski was detained by Polish law enforcement on charges of espionage for Russiа and his case is currently pending a court decision. In his capacity as director of the Russia-Caucuses center and citing public credentials as ‘military expert’, Ivannikov published over 20 papers; several of which tackling the conflict between Georgia and South Ossetia. Half of the articles are about the war in Syria, suggesting that he might have been involved in aspects of Russian operations in Syria. Bellingcat has not yet identified evidence of such involvement. One particular article stands out in demonstrating Ivannikov’s knowledge of air defense missile systems. This article details the S-300 air defense missile system that Russia supplied to Syria in 2016, according to Russia only to defend a Russian naval base. This S-300 air defense missile system was produced by Almaz-Antey, the same defense firm that manufactures the Buk-M1 missile system. The article implies Ivannikov appears to have at a minimum basic technical knowledge about the S-300 Air Defense system, such as the altitude and launch ranges of its missiles, which would be consistent with his studies at the ‘rocket department’ of the Aerospace Faculty of the Moscow Aviation Institute. For the same reasons, it can be presumed he has similar knowledge about the altitude and launch range of other Russian advanced anti-aircraft missile systems, such as the Buk-M1, which – according to a Bellingcat source who graduated from the same institute several years earlier than Ivannikov – were subjects of study at the Aerospace Faculty of the Moscow Aviation Institute. Note: as this investigation progressed, Bellingcat noticed that evidence of Oleg Ivannikov being involved with the International Institute of the Newly Established States had been deleted from the think-tank’s website, along with his webpage as expert for the institute. All articles authored by him for the institute’s website had his name stripped. However, an archived copy of the original websites showing his name can be retrieved here. Information about Ivannikov’s undercover work in Ukraine is based on multiple reports on the activities and alleged crucial role of ‘Andrey Ivanovich’ operating in the LNR in 2014-2015. These reports originate from current or former Russian militants and separatist fighters who were based in the Donbas in 2014-2015. The various reports consistently paint the picture of a senior Russian officer, working under the pseudonym ‘Andrey Ivanovich’, functioning as one of the most important handlers for the Russian Ministry of Defense in Luhansk. Pursuant to these reports, Ivannikov supervised Igor Plotnitsky, who was then the defense minister of the LNR. One report from a Russian former militant commander states that ‘Andrey Ivanovich’ recommended Plotnitsky as potential political leader of LNR to Vladimir Putin’s adviser on Ukraine, Vladislav Surkov; a recommendation which was honored but later regretted. A Russian militant commander, speaking to a pro-Kremlin news site in May 2018, reported that ‘Andrey Ivanovich’ – which he acknowledged was a cover name – was in de facto control not only of then-minister of defense of LNR Plotnitsky and of free-lance Russian militant groups, but also of the direct command of Russia’s private army known as Wagner. This source also claimed ‘Andrey Ivanovich’ represented official Russian structures. Bellingcat and its investigative partners have concluded that it is beyond doubt that the persona ‘Andrey Ivanovich’/’Andrey Ivanych’ described in the aforementioned reports is in fact Oleg Vladimirovich Ivannikov. The descriptions of his role in LNR is fully consistent with his prior role in South Ossetia, as well as the role of Andrey Ivanovich ‘Orion’ that can be extrapolated from the phone calls published by JIT and SBU. Additionally, at least one of the separatist sources described ‘Andrey Ivanovich’ as having the distinctive high-pitched voice identified in Ivannikov. There is no plausible reason to doubt the information on ‘Andrey Ivanovich’ volunteered by these different Russian militant and separatist sources; as it would not be in their interest to forge a coordinated, consistent narrative of a GRU/Russian military commander being in command in a conflict which Russian and separatist authorities have systematically attempted to present as a civil war constrained to intra-Ukraine actors. The GRU officer and former South Ossetian Minister of Defense is not the only Oleg Vladimirovich Ivannikov with a military rank residing in Moscow. Bellingcat identified at least one other person who has the complete same name, and who was born on 9 June 1977 – ten years after Oleg ‘Orion’ Ivannikov. This full namesake frequently shows up in web search results because he is a relatively well-known personality who regularly appears in television interviews and is active on Russian and other social media. This man is a reserve Lieutenant Colonel of the Ministry of Internal Affairs, director of the charity institution ‘Law and Order’ of the Regional Public Foundation for Law Enforcement, and a member of the Council of the Association of Non-Profit Organizations for the Protection of Electoral Rights ‘Civil Control’. Adding to the potential for confusion between the namesakes, this Oleg Ivannikov also wrote a thesis, titled ‘Political struggle in Russia on the national question in the first quarter of the 20th century’, as a candidate of history in Moscow in 2005, and has published multiple articles since 2014, that have appeared on the same information agency, REX, which has published or reshared more than 20 articles written by ‘Orion’ Oleg Ivannikov. Bellingcat and The Insider confirmed that these articles were not written by Ivannikov’s namesake living in Moscow, who also frequently writes on political topics. While analyzing the articles written by Oleg Ivannikov in his role as ‘military expert’ and director of the Russia-Caucuses Research Center, we identified a focus and particular competence in the area of the military conflict between South Ossetia and Georgia. In particular, in an article titled ‘Russia’s peacekeeping activity in South Ossetia in 1992-2008: Premises, Results and Key lessons’, Ivannikov demonstrated thorough knowledge of the exact forms Russia’s military and political support for the South Ossetian separatist project, as well as of the psychology of South Ossetians as an ethnic group. We attempted to identify any role Ivannikov may have played in South Ossetia, but his name did not come up in any South Ossetian-related publications. However, we identified a research center in South Ossetia that belonged to the same parent organization as the Russia-Caucuses center: the ‘Center of Eurasian Studies’. We also found a 2012 blog post from a South Ossetian human-rights activist who claimed that a research center with the same name had been established in South Ossetia by the former minister of defense of South Ossetia, Andrey Ivanovich Laptev, shortly after he retired from that position in early 2008. This coincidence, along with the first name and patronymic ‘Andrey Ivanovich’, led the investigating team to focus its attention on the former minister of South Ossetia, the so-called Andrey Ivanovich Laptev. The earliest reference to Laptev in open sources was from 11 December 2006, when the South Ossetian state news agency ‘RES’ wrote that Andrey Laptev had been appointed to the post of Minister of Defense and Emergencies, and that previously he had served as chief of staff of the Security Council of the Republic of South Ossetia. A 2009 blog post (archive) by Andrey Illarionov, a former economic policy adviser of Russian President Vladimir Putin and now an independent Washington-based analyst, lists the leaders of the “South Ossetian National Movement” and describes Lieutenant General Andrey Ivanovich Laptev as Minister of Defense of South Ossetia from 11 December 2006 to 28 February 2008. During his term, the South Ossetian Ministry of Defense was implicated in deploying Russian mobile anti-aircraft installations in breach of the internationally mediated peace-keeping agreement. In 2009, Novaya Gazeta and Russian-language Georgia Online (archive) published Illarionov’s full investigation into the events that preceded the conflict in South Ossetia and eventually the Russo-Georgian War. Illarionov’s research describes the involvement of Russian FSB and GRU officers in the war and the “development” of South Ossetia. For example, former FSB officers were appointed as heads of the South Ossetian KGB, and Russian military officers were appointed to key positions in the South Ossetian army and Ministry of Defense. Illarionov’s article refers to Laptev as a Russian general, who replaced Anatoly Barankevich as the Minister of Defense of South Ossetia on 11 December 2006. Another article (archive) describes Laptev as closely connected to the residence of the Russian GRU in Tbilisi, which was raided in September 2006, resulting in the arrest of four Russian GRU officers. A 2012 article (archive) in the Russian newspaper Moskovski Komsomolets, published four years after ‘Laptev’ stepped down from his role as South Ossetian Minister of Defense, claims that he then lived in Moscow using a different surname. The RES news agency published an article on 1 March 2008 reporting that Major General Andrey Laptev was awarded the rank of Lieutenant General. A rare interview given by Laptev was published on 3 April 2012, in which he endorsed David Sanakoyev as a presidential candidate in South Ossetia. During this interview, Laptev states that he is 45 years old, making his year of birth either 1966 or 1967. All of the above findings led Bellingcat and its partners to the hypothesis that Andrey Ivanovich Laptev had in fact been a cover pseudonym for Oleg Ivannikov. The Bellingcat team could not find a single photograph or recording (audio or video) of Andrey Laptev, either before, during, or after his stint as South Ossetian Defense Minister. We also consulted with a number of Georgian journalist and experts, who were unable to find any photographs, videos, or audio recordings of Laptev. The reclusive former Defense Minister apparently managed to avoid all cameras during his service, either due to not making any public appearances or from a reticence of journalists to publish and preserve recordings of his public appearances. Only one photograph published by ‘RES’ in 2007 could possibly show (a part of) Laptev. This photograph illustrates a meeting of South Ossetian government officials, including President Eduard Kokoity, with a man in uniform partly visible giving a speech. That person may be Laptev, as the article reports that he made a speech at this meeting. Former Minister of Internal Affairs Mikhail Mindzayev, who also is not visible in the photograph, held a speech before Laptev on this same meeting. An archived version of the website from the same date as this photograph shows the aforementioned photograph was not edited after initial publication, but also a photograph of Mindzayev – also wearing military fatigues – in full view. This lead the Bellingcat team to assume that if in the photograph below the speaker is intentionally left out of view to disguise his identity, it is likely to have been Laptev, as Mindzayev’s face was shown in other photographs. South Ossetian government officials, including President Eduard Kokoity (2nd from left). The man in uniform, just partly visible on the left side of the photograph, is possibly ‘Andrey Laptev’. On 23 February 2010, a meeting was held in Tskhinvali, the capital of South Ossetia, where several South Ossetian and Russian officers and soldiers were presented awards by the president. A high-order medal, the ‘Order of Watsamonga’, was awarded that day to two people: Taymuraz Mamsurov, head of the Republic of North Ossetia-Alania, and ex-Defense Minister Andrey Laptev. Photographs (archive) show Mamsurov with the order, as well as two other men, who apparently were awarded the same order at an earlier time. These men are Valery Valiev, who succeeded Mindzayev as Minister of Internal Affairs, and Ibrahim Gasseev, then deputy minister of defense, and since 2016 the Minister of Defense. However, despite being one of only two people receiving this award at the ceremony, Laptev is nowhere to be seen in these photographs. Bellingcat has also obtained data on border crossing between Russia and the self-proclaimed republic of South Ossetia for the year 2013. Records reviewed by the investigating team show that Oleg Ivannikov travelled to South Ossetia by car for a one-day visit, using a car with a registration plate very likely registered to a federal security agency. A source, who worked in South Ossetia in the period of 2006 to 2008, recognized the photograph of Oleg Ivannikov as South Ossetian Minister of Defense ‘Andrey Laptev’. The Insider reached out to a former member of South Ossetia’s government, who was in office at the time Laptev was Minister of Defense. The former government member confirmed that Laptev’s voice was very high pitched. All of these additional pieces of information gathered by the reporting team further support strongly the hypothesis that Laptev and Ivannikov are the same person. The Bellingcat-led investigation team conclude with a very high degree of certainty that the person named as ‘Andrey Ivanovich’ called ‘Orion’ by the JIT, and whose identification was requested by the JIT via their call for witnesses from 28 September 2016, is Oleg Vladimirovich Ivannikov, a Russian citizen born on 2 April 1967. A phone call between a Ukrainian mobile telephone number known to have been used by Andrey Ivanovich ‘Orion’, during his deployment in Ukraine to a Russian number registered to Oleg Ivannikov. Oleg Ivannikov was, or is, an officer with military aviation education and a postgraduate specialization in rocket systems. In 2017, Oleg Ivannikov provided a business address identified as the headquarters of the GRU in Moscow. Andrey Ivanovich ‘Orion’ was described by former separatists as an officer from the Ministry of Defense and by the SBU as a GRU officer. The voice characteristics, especially fundamental frequency, of Andrey Ivanovich ‘Orion’ and Oleg Ivannikov are very close to one another, which is not a trivial coincidence due to the idiosyncratic pitch which and vocal timbre that are atypical of a male voice. Furthermore, Bellingcat and the reporting partners concluded with a high degree of certainty that Oleg Ivannikov was behind another persona working under an alias: the former minister of defense of the self-proclaimed Republic of South Ossetia in the period 2006-2008, using the alias ‘Andrey Ivanovich Laptev’. This identification was made on the basis of circumstantial evidence including content of specialized academic and journalistic work by Ivannikov, engagement of the two personas in nearly identical academic/NGO institutions, overlap of the name and patronymic between the alias used by Andrey Ivanovich ‘Orion’ and by ‘Laptev’, and – crucially – by the reported vocal similarity between the two. The secondary identification of Ivannikov as ‘Laptev’ provides a consistent and plausible explanation for Ivannikov’s role in two different military conflicts in Russia’s ‘near abroad’ – in Georgia and in Ukraine. Russian media has previously reported, based on interviews with pro-Russian separatists, that Andrey Ivanovich ‘Orion’ served as “adviser to the military command of LNR”, and “is or was an officer of Russia’s Ministry of Defense”. This role is starkly reminiscent of the role ‘Laptev’ played in South Ossetia. It is thus plausible that the Russian Ministry of Defense has deployed Ivannikov, in his capacity of senior GRU officer, as military advisor and de facto military commander to separatist groups abroad working under Russia’s direction. The findings in this report provide new information on Russia’s use of GRU operatives in special operations in neighboring countries. They also establish for the first time – subject to the JIT making public the exact role Ivannikov had in the chain of events that led to the downing of MH17 – a direct link between a high-ranking Russian military officer on active service operating in Ukraine and the destruction of the passenger airliner. When his father correctly was once commander and pilot of the fighterbomber regiment in Siauliai (what periode? ), it could be possible that in 1967 he served for example as a MIG-21PFM or MiG-21S pilot with the 296th Fighterregiment at Altenburg-Nobitz which is about 50 km nordwest of Karl-Marx-Stadt. When was Major General V.P. Ivannikov commander of the 53th GvIAP in Siauliai? Some of the England fans deserve a bit of a beating, but of couse the Russian thugs tried to literally murder the weakest older chaps. Someone should make it absolutely clear what they are getting into. I’m going to have little sympathy for “free the Moscow 5” campaigns and go fund me to be medivaced back to the .UK. Really? He got murdered and it’s his fault? There’s no value in calling out murdering thugs? They are not an issue? That’s how dictators and fascists end up in power. There was an Ivan Laptev who briefly served as the Head the USSR Supreme Soviet in the aftermath of the August 1991 Old Guard coup and also a liberal editor of Izvestiya. Lets hope he didn’t have a son called Andrey or this is going to look very silly. I notice RT haven’t touched this story – whether that is from shock and awe or perhaps because they are observing Napoleon’s old adage: Never interrupt the enemy when they are making a mistake. Why? I don’t have a dog in this fight. The Buk was a legitimate weapon when the Ukrainian airforce was bombing cities. So moving it from point A to point B was a fairly mundane, low-level task. So I expect it was a couple of low-level Ukrainian separatists who were organizing it, using their real first name and patronymic. But if I am wrong, so what? You know where that BUK came from – or at least you do if you aren’t complete imbeciles. So given you royally messed up that issue, what makes you so confident you haven’t done so again? The Buk TELAR which was used to shoot down MH17 came from 53rd brigade in Kursk, Russia. It was photographed in Russia before 2014 multiple times. “,well we already know that, the TELAR was only an element of a complete anti aircraft system. Hence the poor target acquisition. You do seem to have a dog in this fight as you know perfectly well where the BUK came from really,unless you are a complete imbicile. Sean Lamb, you wrote: “The Buk was a legitimate weapon when the Ukrainian airforce was bombing cities”. My question: When and which cities did the Ukrainian air force bomb? $1 a post obfuscation Putinbot.Spread as much false information around as possible and hope that some of it sticks. Ok, as long as ukrainan military would bomb city in russian territority and buk stays on russian teritory this would be true. Russian military vehicle has to stay INSIDE russioan territority. The bad point is, tha Donbas (Luhansk, Donezk) area is not russian territority, but Ukrainian. That BUK is owned by russian military which belongs to russia and which has only to defend russian territory. A russian BUK on ukrainian teritority is an ERROR. Russian tanks on ukrainian teritority is also an ERROR. Russian soldiers in mission on ukrainian teritory is also an ERROR. Have you ever heard of the Responsibility to Protect doctrine? The “Responsibility to Protect Russia” inside ukrainian territory??? People forget that Russia is the mother of the most bloodthirsty ideology ever -Russian bolshevism- that murdered tens of millions. Still Russians are not only proud of their soviet past but keep on worshipping mass murderers like Stalin, who is God for them! So why would they care if 298 passengers -plus the crew- died? See who funded Lenin and the rest of them. Ask the RBS Group how they got their funds away from Russia in the beginning of the 20th century (more than 80% of assets tied down in Russia and they get out unbelievably unscathed?). Pay attention to all the foreigners who came to Russia to propagate communism ideas (ask my great-grandpa, in particular). First West funds communists, now ISIS, what will they do next, hmmm? Russian tsarism wasn’t much better than communism, which is despotism+collectivism. Western values are based on individualism and freedom which are non-compatible with the Russian totalitarian “way of life” . Please define “very high certainty” as a percentage. Then show the scientifically correct process & calculation used to get to that percentage. Now that we know the JIT has identified the 53th Brigade from Kursk as the unit that operated the Buk let us concentrate on other key persons of interest as identified by other researchers or the RF MoD Site itself. Thanks again for your keen and well reasoned reporting . Obviously Russia is in a state of denial and trying to figure out how it can lie its way out of this one , an impossible task of course . Putin will have to give up some of his cronies to survive but can he survive ? The trail of the smoking gun is quite obvious and so he’ll have to create some diversionary tactics…. Superior intelligence work from the bellingcat people. This is better work than what we usually see from professional journalists. Thank you! about telecom data, we likely still would have been searching now. Serial code on Buk missile fragments shown by JIT indicate it was made in 1986. All such missiles used by @mod_russia were destroyed in 2011 (max 25y service). Meanwhile Ukraine, which has 20 Buk divisions, has NO Buk missiles produced after 1991, only old ones #MH17hat the serial number of the Buk was of group destroyed in 2011 as past their 25 year use by date. Can anyone comment on this assertion? I have 2 observations ,firstly western countries have been know to use up elderly ammunition stocks in the middle east.Used defensively, you would like to be certain that the missile works.If you are just taking pot shots outside your own borders and not defending your own troops, why expend brand new multi million dollar ordnance?Also you might not want to risk losing your latest tech in such a theatre. Secondly, I used to work on surface to air missiles and we had drill rounds for handling practice and loading tests,display rounds for public display (these were totally empty and all the dimensions were false),telemetry rounds with instrumentation and no warhead and practice rounds with concrete warheads. The point I am making is that you should be careful when missile spotting because the missile that you see is not necessarily what they are actually using. The give away of a live British (and NATO) missile was the yellow and brown rings which indicated high explosives and propellant.Things may have changed a bit, as all of this was a while ago. Is the zoomed in photo of the missile cases with numbers real or fake? I can’t find any photo of the trucks from Reuters that could be zoomed in like that and read any numbers. What’s the original source of the zoomed in photo? There is a building number 76G on Ulitsa Poliny Osipenko (at the end the map that you uploaded). That is the simplest explanation for a delivery address of 76 Ulitsa Poliny Osipenko. Is it know what that building is, and if it is part of the GRU complex? Right-click that building, choose “What’s here?” (or look in Wikipedia or Google Maps), that building is not Osipenko, but Khoroshovskoye. However if you go into Google Street View this building has a blue street sign attached to it. It is difficult to make out, but this sign reads “Poliny Osipenko”. I am not an expert on Russian or Soviet urban planning, but this suggests that this building can be reasonably considered to be on Poliny Osipenko street (particularly if someone wants to make it easy for a private package delivery firm to deliver a package without getting lost, as is the case here). If the number 76G is indeed accurate, then it would be interesting to know what is in this building, who goes in and out, etc. That sign is without building number. Perhaps it marks an end of the street. That building did have a Khoroshovskoye 76G sign, but it was removed and a new Poliny Osipenko sign was put up sometime between June 2015 and Oct 2016. Possibly around the same time that shoe retailer Tervolina moved their offices from that building. The building appears to be vacant in the latest Google and Yandex street panoramas (security cameras are gone, parking lot is empty, and the parking lot entrance now has parked cars blocking it). It’s apparently not that difficult to remove or change a street sign.